I wonder about your ripe winter tomatoes do they have the same good flavor as summer tomatoes? About the tree frog — your BBQ party story was funny! That frog sound is about the same as the sound I heard. Hard to tell from the video how loud that frog really is. The one that was on my car door was LOUD it scared the @#$% out of me. LOL It was funny after it screamed I was looking around wondering, what the #@$% was that??? I did not know which way to look when I reached for the door handle again it screamed again. After the 2nd scream I knew it had to be right in front of me, it took a few seconds to finally spot it on the door. It was a tiny frog. I had to laugh how could such a loud scream come from such a tiny frog. LOL. It was about 1.5" to maybe 1.75" long. The frog was right in my face arms length away about 24" I guess being that close made it seem much louder than a frog that is not so close. When I grew tomatoes in Arizona my best crop was planted Nov 1st I had ripe tomatoes in Jan. Plants looked good, tomatoes seemed a bit smaller, flavor seemed not quite as good as spring tomatoes but I never though much about it. It was in the 40s at night and 65 to 70 every day. 3 weeks in Feb AZ has 20 degree weather tomatoes die. I planted tomatoes again about first week of March and had ripe tomatoes in May. I know sunlight it not as bright in winter as summer I have always thought mirrors on the north side of the garden could be used to double the light in the garden in winter. Once I had 3 large 36" x24" mirrors that I set up to add light to my tomatoes in Oct. It sure did make a bright spot in the garden but the spot moved with the sun. 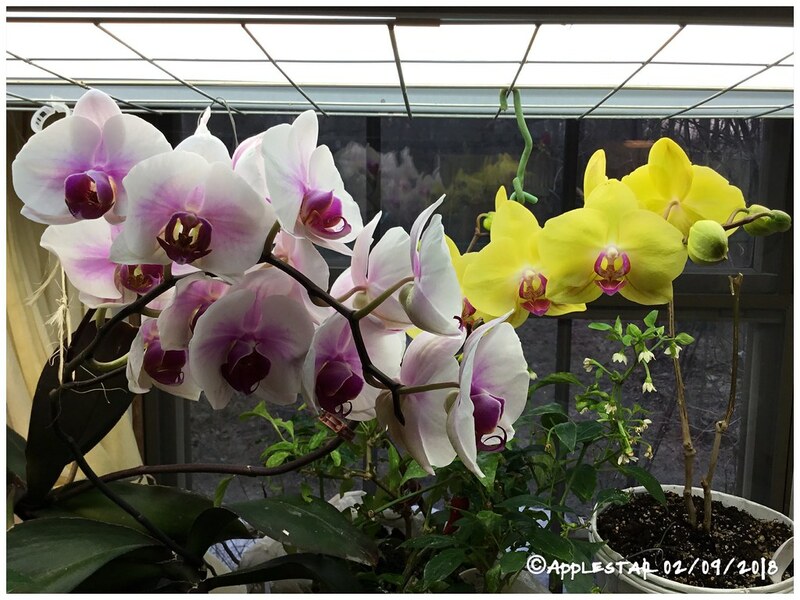 I think a grow light in winter will be good to add extra light the sun is not producing. Extra light might make larger better flavor tomatoes. There is a lot of Red color light in winter green, blue, violet are mostly gone. You have proven tomatoes are smaller & have less flavor in winter, I have always wondered if it was from colder weather or less sunlight or both? 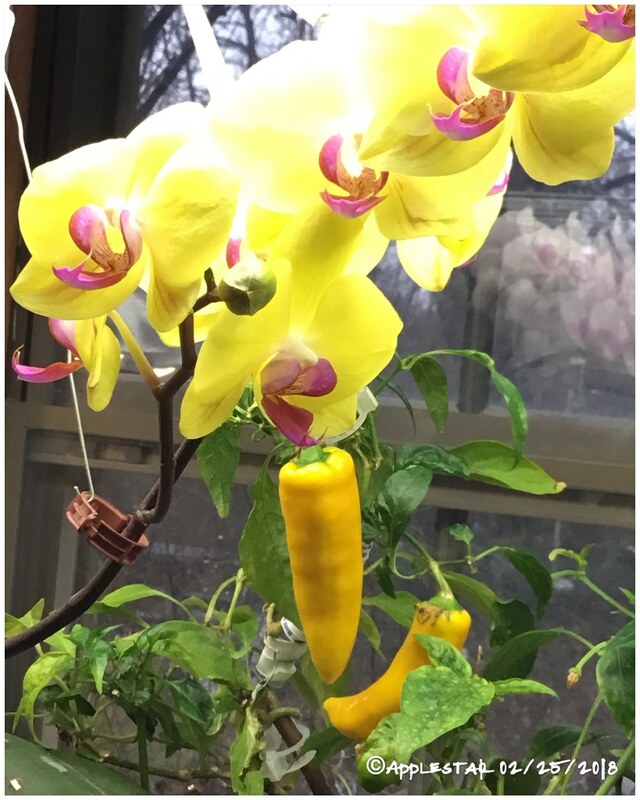 ...I lost the tag for the pepper plant trying to compete. 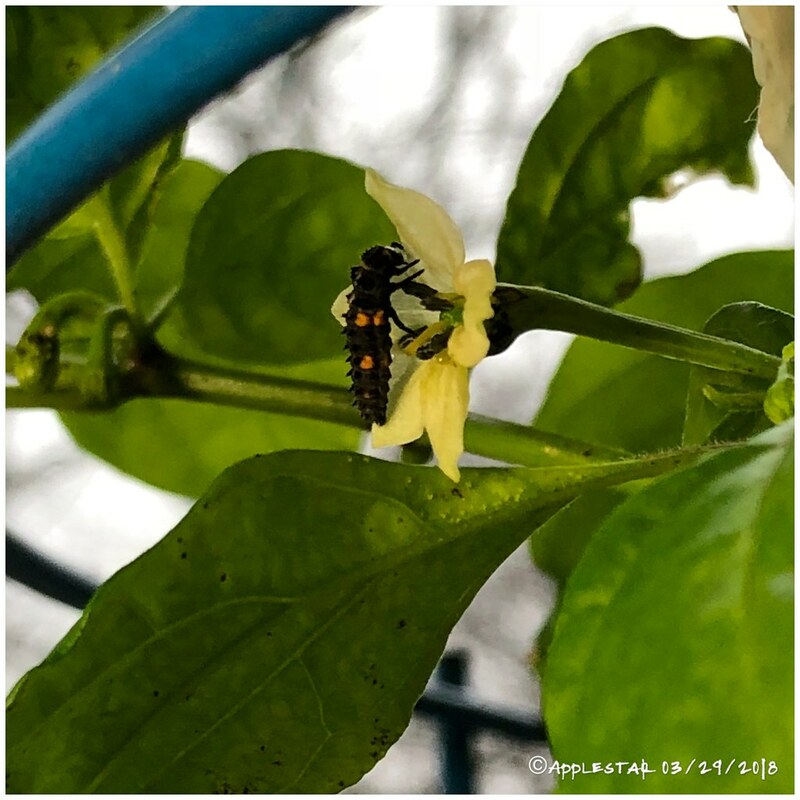 — I saw a ladybug working of ridding it of aphids. I hope there are more since the orchid pollen will help to sustain them and hopefully feed them enough to mate and lay eggs. Others are responding to lengthening days and starting to grow new leaves/branches and flower buds. Ones that had been dropping blossoms in the colder temperatures are not doing that any more, so I have to pluck the too-many flower buds, especially ones that need to grow good leafy canopy first and ones that are still in tiny pots with tiny root systems that won’t be able support the excessive growths. Sooo excited — I came across a new to me insect! - Found in the Winter Indoor Garden. 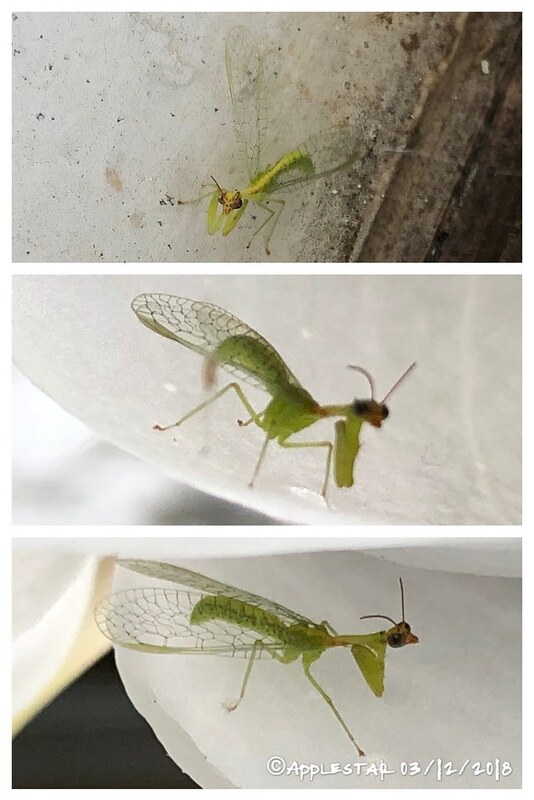 - looks like a tiny baby praying mantis? ...with wings???? Predatory: larvae feed on spider eggs; adult small insects. This is the overwintered Trinidad Scorpion Chocolate in upstairs SE bedroom window. It had just started to bloom in the fall when the frost became imminent, so I dug the two plants up and potted them. They bloomed sporadically through the winter but never set fruits. In the Winter Indoor Garden, by this time of the year, when there is yet another month to 6 weeks to go at least until the outside overnight low temperatures settle down and stay above danger levels, the plants are stressed from the less than ideal winter Indoor conditions, even though the lengthening day’s and rising temperatures encourage them to start growing. And this is also the time of the year, with arrival of spring thaw, that flooded out and busy ants make their way inside — the Scouts find the Winter Indoor Garden an ideal temporary pasture for their flock of aphids and other sucking pests. 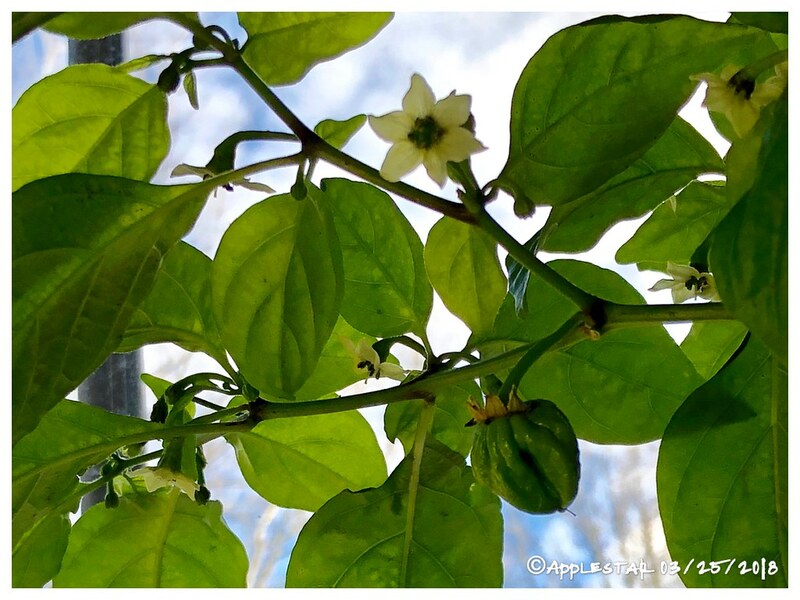 Sometimes the aphid pressure can be overwhelming for the tender new pepper leaf and flower buds. ...but not to worry! The Indoor Garden Patrol is on the job! ...I saw a pair of ladybugs mating just a couple of days ago, so hopefully there will be more reinforcements soon.